On Sunday afternoon (5th June 1921) a tablet bearing the names – 15 in number – of the men from this parish who lost their lives in the war, was unveiled in the church the presence of a large congregation. The service was conducted by the Canon Wrangham, a former rector and now Rural Dean of Cricklade and Rev JS Fowle, the present rector. The lesson was read by Mr EH Clutterbuck and the tablet was unveiled by Colonel J Hankey, and the subsequent dedication being performed by Canon Wrangham who gave a short address and "The Last Post" being sounded by Mr Jones of Chippenham. 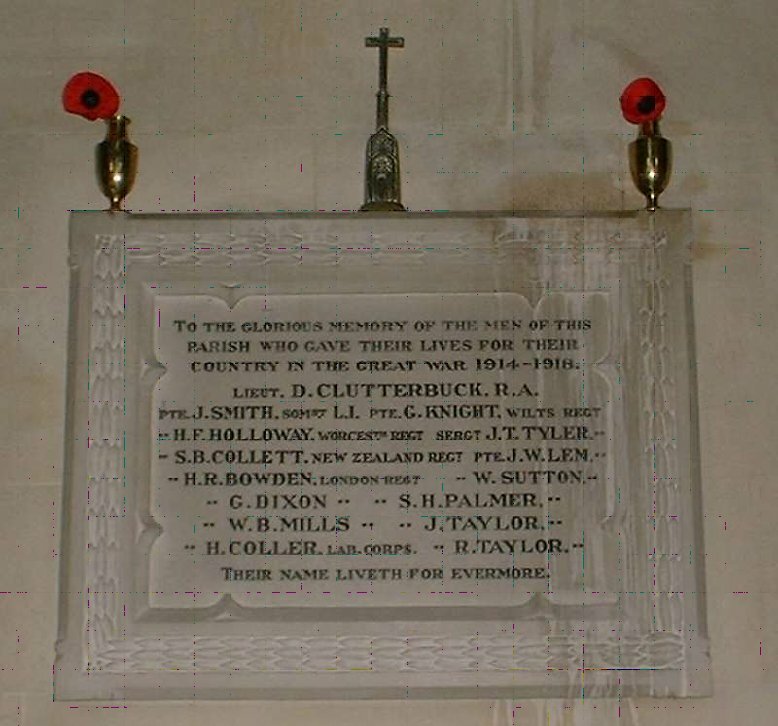 "In Glorious memory of the men of this parish who gave their lives for their country in the Great War 1914 – 1918"